In some old magazine or newspaper, I recollect a story, told as truth, of a man - let us call him Wakefield - who absented himself for a long time, from his wife. The fact, thus abstractedly is not very uncommon, nor - without a proper distinction of circumstances - to be condemned either as naughty or nonsensical. Howbeit, this, though far from the most aggravated, is perhaps the strangest instance, on record, of marital delinquency; and, moreover, as remarkable a freak as may be found in the whole list of human oddities. The wedded couple lived in London. The man, under presence of going a journey, took lodgings in the next street to his own house, and there, unheard of by his wife or friends, and without the shadow of a reason for such self-banishment, dwelt upwards of twenty years. During that period, he beheld his home every day, and frequently the forlorn Mrs. Wakefield. And after so great a gap in his matrimonial felicity - when his death was reckoned certain, his estate settled, his name dismissed from memory, and his wife, long, long ago, resigned to her autumnal widowhood - he entered the door one evening, quietly, as from a day's absence, and became a loving spouse till death. This outline is all that I remember. But the incident, though of the purest originality, unexampled, and probably never to be repeated, is one, I think, which appeals to the general sympathies of mankind. We know, each for himself, that none of us would perpetrate such a folly, yet feel as if some other might. To my own contemplations, at least, it has often recurred, always wonder, but with a sense that the story must be true, and a conception of its hero's character. Whenever any subject so forcibly affects the mind, time is well spent in thinking of it. If the reader choose, let him do his own meditation; or if he prefer to ramble with me through the twenty years of Wakefield's vagary, I bid him welcome; trusting that there will be a pervading spirit and a moral, even should we fail to find them, done up neatly, and condensed into the final sentence. Thought has always its efficacy, and every striking incident its moral. What sort of a man was Wakefield? We are free to shape out our own idea, and call it by his name. He was now in the meridian of life; his matrimonial affections, never violent, were sobered into a calm, habitual sentiment; of all husbands, he was likely to be the most constant, because a certain sluggishness would keep his heart at rest, wherever it might be placed. He was intellectual, but not actively so; his mind occupied itself in long and lazy musings, that tended to no purpose, or had not vigor to attain it; his thoughts were seldom so energetic as to seize hold of words. Imagination, in the proper meaning of the term, made no part of Wakefield's gifts. With a cold, but not depraved nor wandering heart, and a mind never feverish with riotous thoughts, nor perplexed with originality, who could have anticipated, that our friend would entitle himself to a foremost place among the doers of eccentric deeds? Had his acquaintances been asked, who was the man in London, the surest to perform nothing to-day which should be remembered on the morrow, they would have thought of Wakefield. Only the wife of his bosom might have hesitated. She, without having analyzed his character, was partly aware of a quiet selfishness, that had rusted into his inactive mind - of a peculiar sort of vanity, the most uneasy attribute about him - of a disposition to craft, which had seldom produced more positive effects than the keeping of petty secrets, hardly worth revealing - and, lastly, of what she called a little strangeness, sometimes, in the good man. This latter quality is indefinable, and perhaps non-existent. Let us now imagine Wakefield bidding adieu to his wife. It is the dusk of an October evening. His equipment is a drab great-coat, a hat covered with an oil-cloth, top boots, an umbrella in one hand and a small portmanteau in the other. He has informed Mrs. Wakefield that he is to take the night-coach into the country. She would fain inquire the length of his journey, its object, and the probable time of his return; but, indulgent to his harmless love of mystery, interrogates him only by a look. He tells her not to expect him positively by the return coach, nor to be alarmed should he tarry three or four days; but, at all events, to look for him at supper on Friday evening. Wakefield himself, be it considered, has no suspicion of what is before him. He holds out his hand; she gives her own, and meets his parting kiss, in the matter-of-course way of a ten years' matrimony; and forth goes the middle-aged Mr. Wakefield, almost resolved to perplex his good lady by a whole week's absence. After the door has closed behind him, she perceives it thrust partly open, and a vision of her husband's face, through the aperture, smiling on her, and gone in a moment. For the time, this little incident is dismissed without a thought. But, long afterwards, when she has been more years a widow than a wife, that smile recurs, and flickers across all her reminiscences of Wakefield's visage. In her many musings, she surrounds the original smile with a multitude of fantasies, which make it strange and awful; as, for instance, if she imagines him in a coffin, that parting look is frozen on his pale features; or, if she dreams of him in Heaven, still his blessed spirit wears a quiet and crafty smile. Yet, for its sake, when all others have given him up for dead, she sometimes doubts whether she is a widow. But, our business is with the husband. We must hurry after him, along the street, erehelose his individuality, and melt into the great mass of London life. It would be vain searching for him there. Let us follow close at his heels, therefore, until, after several superfluous turns and doublings, we find him comfortably established by the fireside of a small apartment, previously bespoken. He is in the next street to his own, and at his journey's end. He can scarcely trust his good fortune, in having got thither unperceived - recollecting that, at one time, he was delayed by the throng, in the very focus of a lighted lantern; and, again, there were footsteps, that seemed to tread behind his own, distinct from the multitudinous tramp around him; and, anon, he heard a voice shouting afar, and fancied that it called his name. Doubtless, a dozen busy-bodies had been watching him, and told his wife the whole affair. Poor Wakefield! Little knowest thou shine own insignificance in this great world! No mortal eye but mine has traced thee. Go quietly to thy bed, foolish man; and, on the morrow, if thou wilt be wise, get thee home to good Mrs. Wakefield, and tell her the truth. Remove not thyself, even for a little week, from thy place in her chaste bosom. Were she, for a single moment, to deem thee dead, or lost, or lastingly divided from her, thou wouldst be woefully conscious of a change in thy true wife, forever after. It is perilous to make a chasm in human affections; not that they gape so long and wide-but so quickly close again! Almost repenting of his frolic, or whatever it may be termed, Wakefield lies down betimes, and starting from his first nap, spreads forth his arms into the wide and solitary waste of the unaccustomed bed. "No" - thinks he, gathering the bed-clothes about him - "I will not sleep alone another night." In the morning, he rises earlier than usual, and sets himself to consider what he really means to do. Such are his loose and rambling modes of thought, that he has taken this very singular step, with the consciousness of a purpose, indeed, but without being able to define it sufficiently his own contemplation. The vagueness of the project, and the convulsive effort with which he plunges into the execution of it, are equally characteristic of a feeble-minded man. Wakefield sifts his ideas, however, as minutely as he may, and finds himself curious to know the progress of matters at home - how his exemplary wife will endure her widowhood, of a week; and, briefly, how the little sphere of creatures and circumstances, in which he was a central object, will be affected by his removal. A morbid vanity, therefore, lies nearest the bottom of the affair. But, how is he to attain his ends? Not, certainly, by keeping close in this comfortable lodging, where, though he slept and awoke in the next street to his home, he is as effectually abroad, as if the stage-coach had been whirling him away all night. Yet, should he reappear, the whole project is knocked in the head. His poor brains being hopelessly puzzled with this dilemma, he at length ventures out, partly resolving to cross the head of the street, and send one hasty glance towards his forsaken domicile. Habit - for he is a man of habits - takes him by the hand, and guides him, wholly unaware, to his own door, where, just at the critical moment, he is aroused by the scraping of his foot upon the step. Wakefield! whither are you going? At that instant, his fate was turning on the pivot. Little dreaming of the doom to which his first backward step devotes him, he hurries away, breathless with agitation hitherto unfelt, and hardly dares turn his head, at the distant corner. Can it be, that nobody caught sight of him? Will not the whole household - the decent Mrs. Wakefield, the smart maid-servant, and the dirty little foot-boy - raise a hue-and-cry, through London streets, in pursuit of their fugitive lord and master? Wonderful escape! l legathers courage to pause and look homeward, but is perplexed with a sense of change about the familiar edifice, such as affects us all, when, after a separation of months or years, we again see some hill or lake, or work of art, with which we were friends, of old. In ordinary cases, this indescribable impression is caused by the comparison and contrast between our imperfect reminiscences and the reality. In Wakefield, the magic of a single night has wrought a similar transformation, because, in that brief period, a great moral change has been effected. But this is a secret from himself. Before leaving the spot, he catches a far and momentary glimpse of his wife, passing athwart the front window, with her face turned towards the head of the street. The crafty nincompoop takes to his heels, scared with the idea, that, among a thousand such atoms of mortality, her eye must have detected him. Right glad is his heart, though his brain be somewhat dizzy, when he finds himself by the coal-fire of his lodgings. So much for the commencement of this long whim-wham. After the initial conception, and the stirring up of the man's sluggish temperament to put it in practice, the whole matter evolves itself in a natural train. We may suppose him, as the result of deep deliberation, buying a new wig, of reddish hair, and selecting sundry garments, in a fashion unlike his customary suit of brown, from a Jew's old-clothes bag. It is accomplished. Wakefield is another man. The new system being now established, a retrograde movement to the old would be almost as difficult as the step that placed him in his unparalleled position. Furthermore, he is rendered obstinate by a sulkiness, occasionally incident to his temper, and brought on, at present, by the inadequate sensation which he conceives to have been produced in the bosom of Mrs. Wakefield. He will not go back until she be frightened half to death. Well, twice or thrice has she passed before his sight, each time with a heavier step, a paler cheek, and more anxious brow; and, in the third week of his non-appearance, he detects a portent of evil entering the house, in the guise of an apothecary. Next day, the knocker is muffled. Towards night-fall, comes the chariot of a physician, and deposits its big-wigged and solemn burthen at Wakefield's door, whence, after a quarter of an hour's visit, he emerges, perchance the herald of a funeral. Dear woman! Will she die? By this time, Wakefield is excited to something like energy of feeling, but still lingers away from his wife's bedside, pleading with his conscience, that she must not be disturbed at such a juncture. If aught else restrains him, he does not know it. In the course of a few weeks, she gradually recovers; the crisis is over; her heart is sad, perhaps, but quiet; and, let him return soon or late, it will never be feverish for him again. Such ideas glimmer through the mist of Wakefield's mind, and render him indistinctly conscious, that an almost impassable gulf divides his hired apartment from his former home. "It is but in the next street!" he sometimes says. Fool! it is in another world. Hitherto, he has put off his return from one particular day to another; henceforward, he leaves the precise time undetermined. Not to-morrow - probably next week - pretty soon. Poor man! The dead have nearly as much chance of re-visiting their earthly homes, as the self-banished Wakefield. Now for a scene! Amid the throng of a London street, we distinguish a man, now waxing elderly, with few characteristics to attract careless observers, yet bearing, in his whole aspect, the hand-writing of no common fate, for such as have the skill to read it. He is meagre; his low and narrow forehead is deeply wrinkled; his eyes, small and lustreless, sometimes wander apprehensively about him, but oftener seem to look inward. He bends his head, but moves with an indescribable obliquity of gait, as if unwilling to display his full front to the world. Watch him, long enough to see what we have described, and you will allow, that circumstances - which often produce remarkable men from nature's ordinary handiwork - have produced one such here. Next, leaving him to sidle along the foot-walk, cast your eyes in the opposite direction, where a portly female, considerably in the wane of life, with a prayer-book in her hand, is proceeding to yonder church. She has the placid mien of settled widowhood. Her regrets have either died away, or have become so essential to her heart, that they would be poorly exchanged for joy. Just as the lean man and well conditioned woman are passing, a slight obstruction occurs, and brings these two figures directly in contact. Their hands touch; the pressure of the crowd forces her bosom against his shoulder; they stand, face to face, staring into each other's eyes. 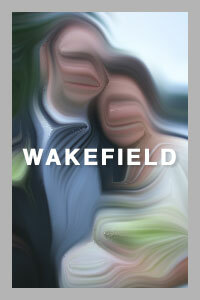 After a ten years' separation, thus Wakefield meets his wife! The throng eddies away, and carries them asunder. The sober widow, resuming her former pace, proceeds to church, but pauses in the portal, and throws a perplexed glance along the street. She passes in, however, opening her prayer-book as she goes. And the man? With so wild a face, that busy and selfish London stands to gaze after him, he hurries to his lodgings, bolts the door, and throws himself upon the bed. The latent feelings of years break out; his feeble mind acquires a brief energy from their strength; all the miserable strangeness of his life is revealed to him at a glance; and he cries out, passionately - "Wakefield! Wakefield! You are mad!" Perhaps he was so. The singularity of his situation must have so moulded him to itself, that, considered in regard to his fellow-creatures and the business of life, he could not be said to possess his right mind. He had contrived, or rather he had happened, to dissever himself from the world - to vanish - to give up his place and privileges with living men, without being admitted among the dead. The life of a hermit is nowise parallel to his. He was in the bustle of the city, as of old; but the crowd swept by, and saw him not; he was, we may figuratively say, always beside his wife, and at his hearth, yet must never feel the warmth of the one, nor the affection of the other. It was Wakefield's unprecedented fate, to retain his original share of human sympathies, and to be still involved in human interests, while he had lost his reciprocal influence on them. It would be a most curious speculation, to trace out the effect of such circumstances on his heart and intellect, separately, and in unison. Yet, changed as he was, he would seldom be conscious of it, but deem himself the same man as ever; glimpses of the truth, indeed, would come, but only for the moment; and still he would keep saying - "I shall soon go back!" - nor reflect, that he had been saying so for twenty years. I conceive, also, that these twenty years would appear, in the retrospect, scarcely longer than the week to which Wakefield had at first limited his absence. He would look on the affair as no more than an interlude in the main business of his life. When, after a little while more, he should deem it time to re-enter his parlor, his wife would clap her hands for joy, on beholding the middle-aged Mr. Wakefield. Alas, what a mistake! Would Time but await the close of our favorite follies, we should be young men, all of us, and till Doom's Day. One evening, in the twentieth year since he vanished, Wakefield is taking his customary walk towards the dwelling which he still calls his own. It is a gusty night of autumn, with frequent showers, that patter down upon the pavement, and are gone, before a man can put up his umbrella. Pausing near the house, Wakefield discerns, through the parlor windows of the second floor, the red glow, and the glimmer and fitful flash, of a comfortable fire. On the ceiling, appears a grotesque shadow of good Mrs. Wakefield. The cap, the nose and chin, and the broad waist, form an admirable caricature, which dances, moreover, with the up-flickering and down-sinking blaze, almost too merrily for the shade of an elderly widow. At this instant, a shower chances to fall, and is driven, by the unmannerly gust, full into Wakefield's face and bosom. He is quite penetrated with its autumnal chill. Shall he stand, wet and shivering here, when his own hearth has a good fire to warm him, and his own wife will run to fetch the gray coat and small-clothes, which, doubtless, she has kept carefully in the closet of their bed-chamber? No! Wakefield is no such fool. He ascends the steps - heavily! - for twenty years have stiffened his legs, since he came down - but he knows it not. Stay, Wakefield! Would you go to the sole home that is left you? Then step into your grave! The door opens. As he passes in, we have a parting glimpse of his visage, and recognize the crafty smile, which was the precursor of the little joke, that he has ever since been playing off at his wife's expense. How unmercifully has he quizzed the poor woman! Well; a good night's rest to Wakefield! This happy event - supposing it to be such - could only have occurred at an unpremeditated moment. We will not follow our friend across the threshold. He has left us much food for thought, a portion of which shall lend its wisdom to a moral; and be shaped into a figure. Amid the seeming confusion of our mysterious world, individuals are so nicely adjusted to a system, and systems to one another, and to a whole, that, by stepping aside for a moment, a man exposes himself to a fearful risk of losing his place forever. Like Wakefield, he may become, as it were, the Outcast of the Universe. At night, under the shadow of of a great mountain, a family receive a visit from an emotional stranger.